Happy Monday everyone! 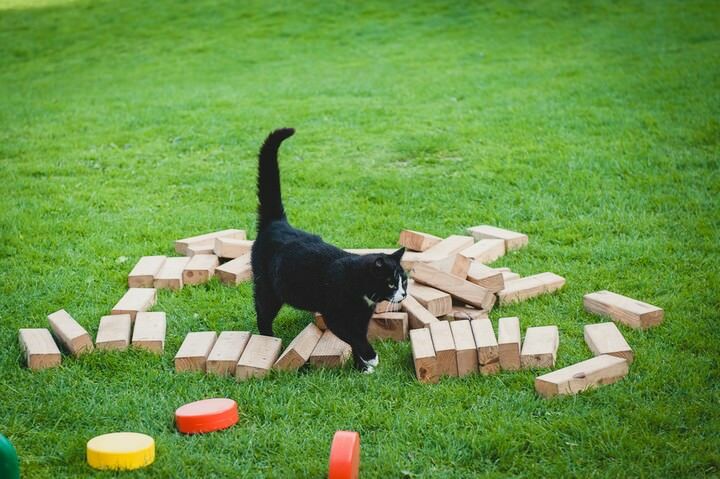 I hope you have all had a marvelous weekend? are you snowed in or are you OK? are you still enjoying the snow or is it beginning to get on your nerves a little? I manged to go out and get a few pictures yesterday, it’s been a while since I used my camera (unless you count taking endless pictures of Dee) so it was nice to go and have something to photograph. Now if the snow could kindly melt so we can get on with our week that would be lovely! Anyway enough about the weather! 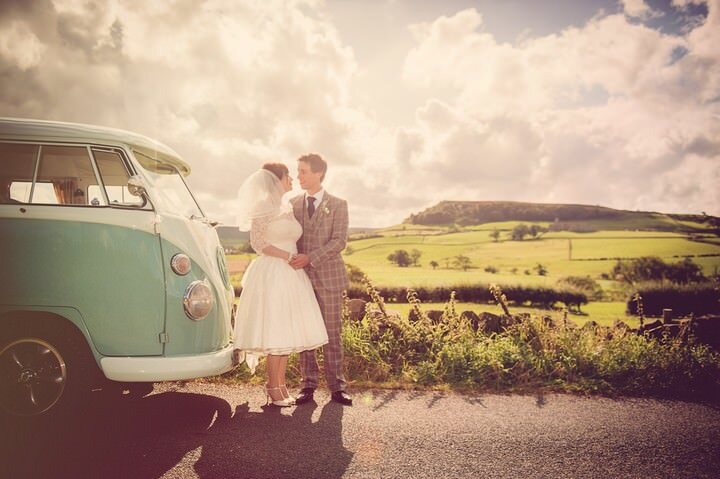 I have a fabulous wedding for you today and it even has a bit of sunshine! 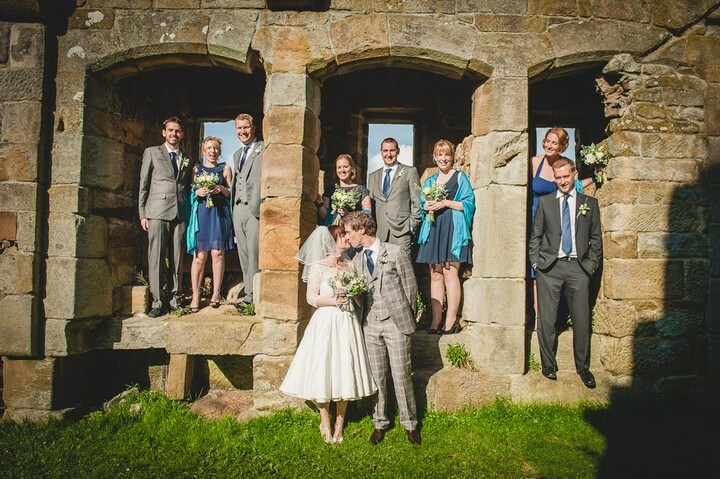 Sent into me by Chris Milner, it is a wonderful Yorkshire wedding which took place at the ever popular Danby castle, which is probably the most featured wedding venue I have on the Blog! 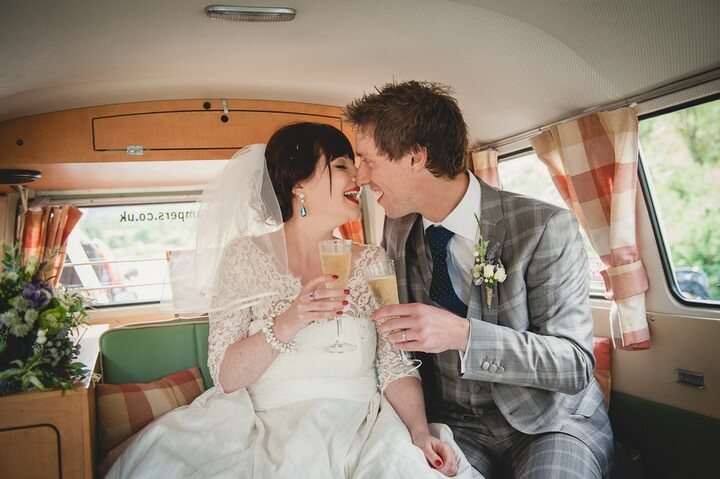 ‘Just the best day of our lives – full of love and laughter (and random skiing props). 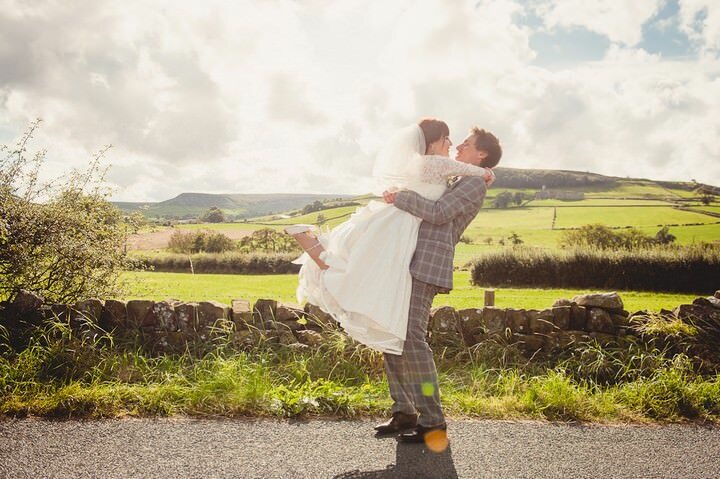 We were so lucky to have gorgeous weather, stunning scenery and wonderful friends and family. We met at University in halls of residence, lived in a house share in 2nd year then got together just before Kev’s final year and my year abroad – not ideal timing! But we have been together 12 years, so it all worked out in the end. It was in bed, in a gorgeous hotel in Paris, the day after my 30th birthday –Kev had booked a surprise trip away. We celebrated with steak-frites and vin rouge on the Ile St-Louis. 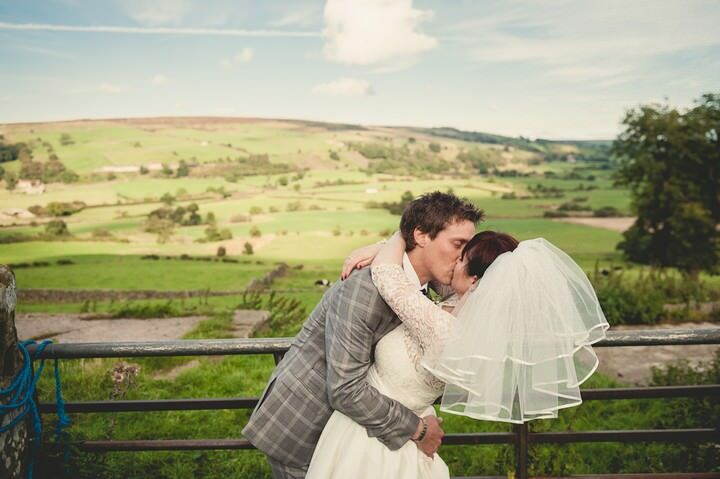 Once we had ruled out a ski lodge in Slovenia, we knew we wanted to get married in Yorkshire, as we met in Leeds and still live here – plus it is such a gorgeous part of the world. We loved Whitby already then venturing further inland, discovered how stunning the Esk Valley is. 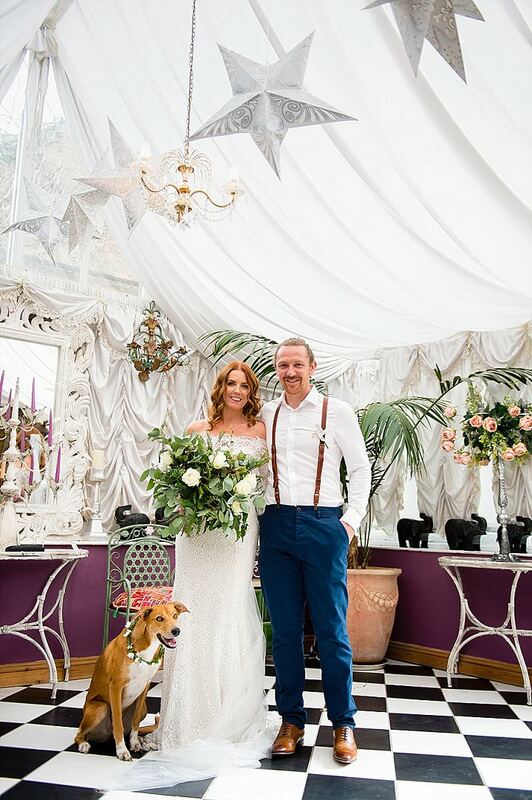 It was also important to us to have the wedding somewhere people would enjoy visiting as most people would have to travel – we were delighted that many of our guests decided to stay on for a holiday. 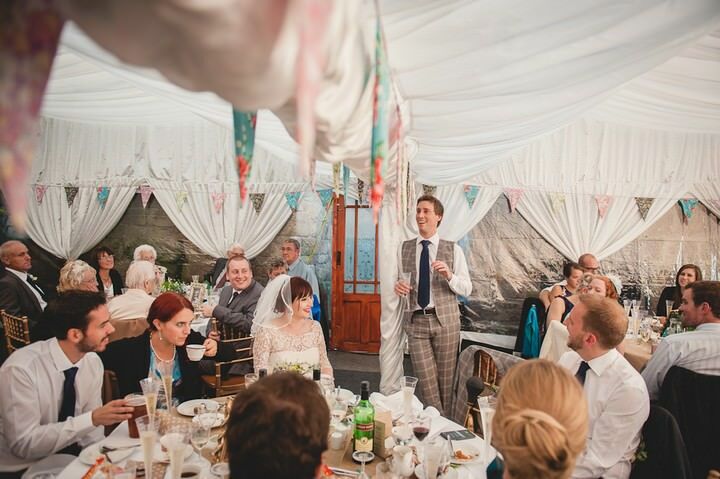 In terms of venues – we knew we wanted somewhere laid back, in a gorgeous setting and a bit quirky. 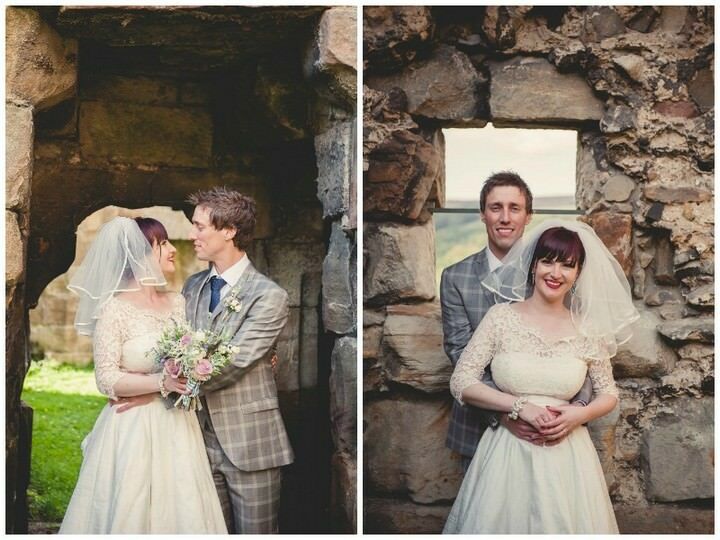 Even on paper, Danby Castle could not have been more perfect! 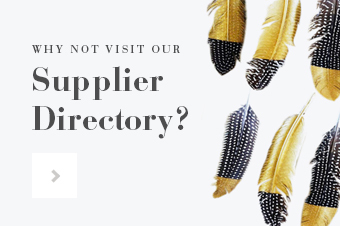 We then went to visit on a cold, wet day in January and knew it was “the one” when we met Carolyn, the owner and her team, who are amazing – so friendly, helpful and organised. 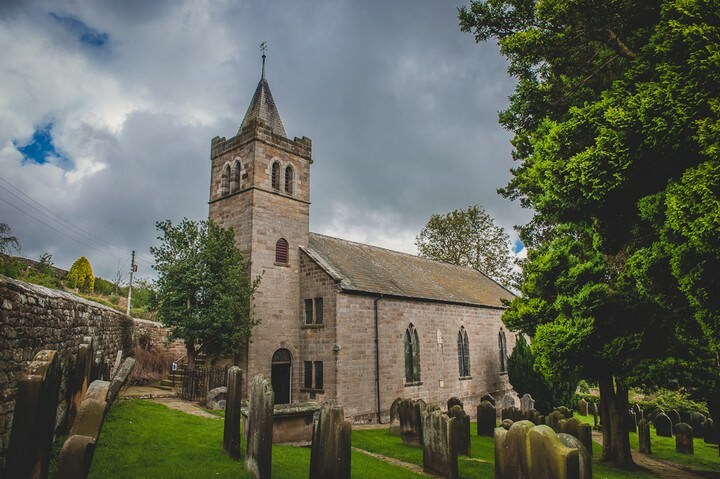 We originally intended to have our ceremony at Danby Castle too, then realised it would mean a lot to get married in a church. 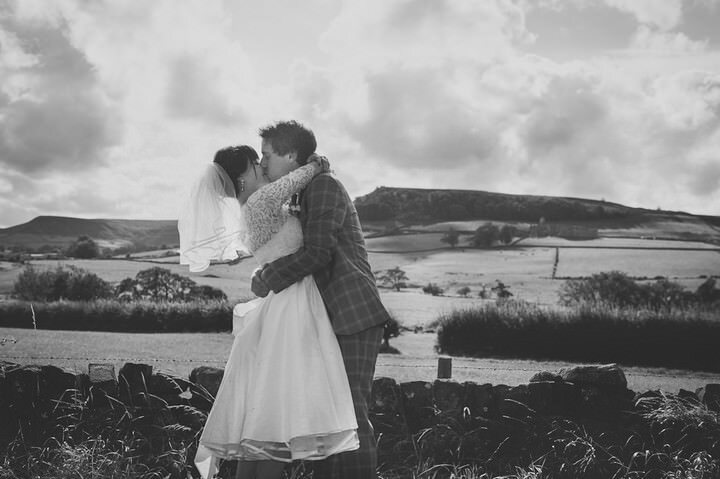 By this point, we’d paid our deposit, so the search was on to find a vicar willing to marry us, despite us not living locally. Thankfully we found Christine, the vicar at St Thomas who is lovely and accommodating. 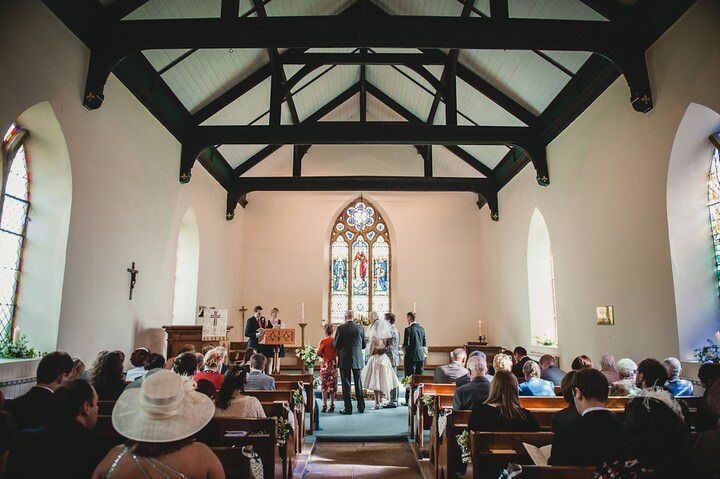 We went to church in the area on a regular basis which added to the excitement and build up to the wedding and were made to feel very welcome. Most of the congregation were involved in some way, e.g. 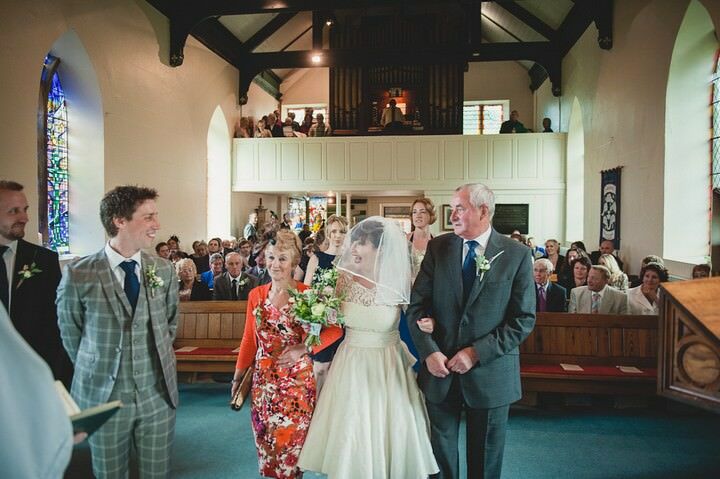 doing the flowers, singing in the choir, which made the ceremony very special indeed. Chris was the only photographer we met. I had done an extensive amount of googling and when we saw Chris’ blog we loved his style in that he used a variety of finishes to suit the particular photo. He was very friendly and not pushy via email, and so nice in real life we decided just to go for it and book him. A decision we were very happy with indeed! 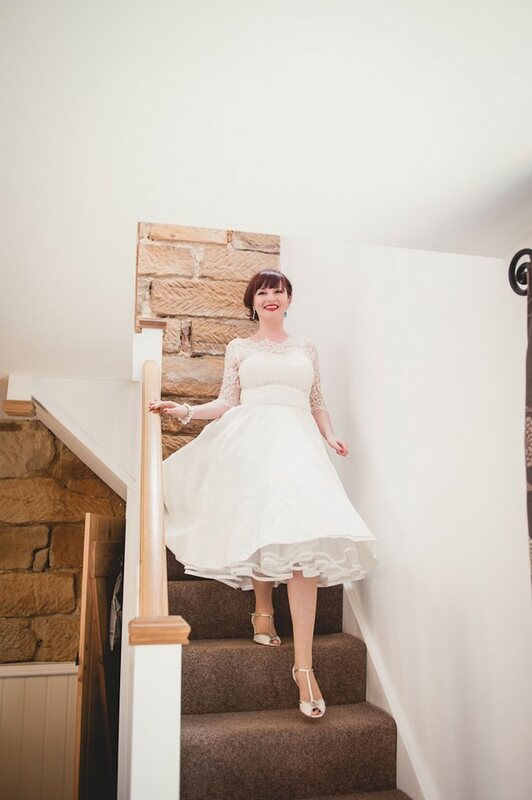 My dress was Josie by Lizzie Jayne. 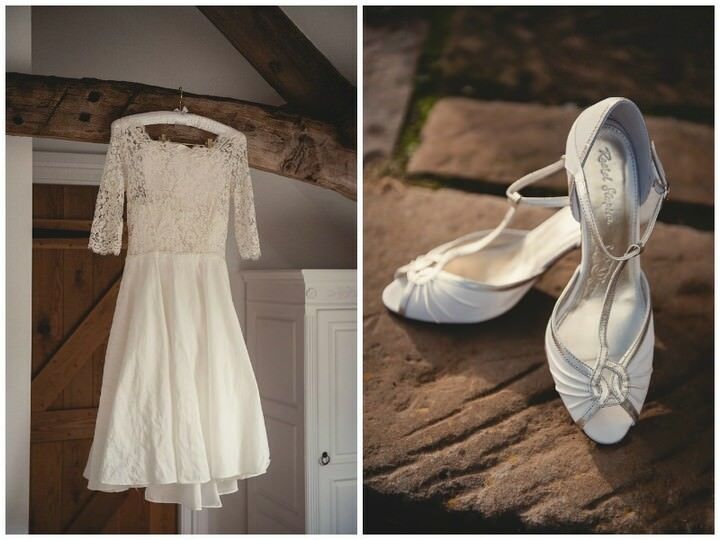 One of my bridesmaids and I went to the Designer Vintage Bridal Show at Edgbaston to buy my shoes (Mimi by Rachel Simpson) rather than the dress and then there it was… love at first sight! Lizzie is absolutely lovely, which also helped seal the deal. 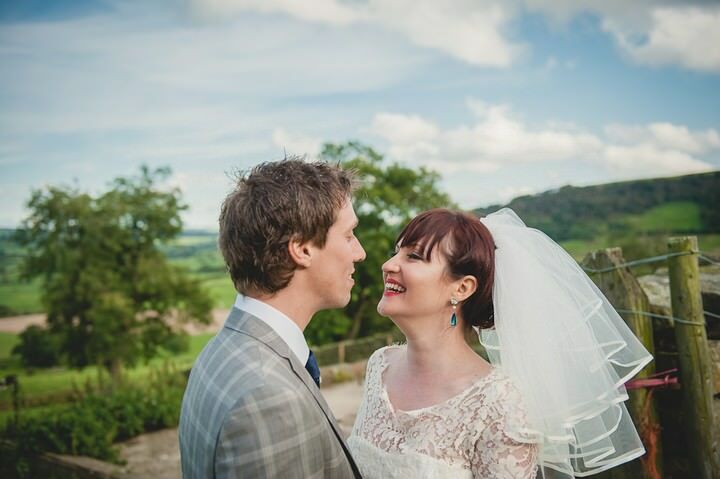 My poufy veil was made by a very talented friend, Hannah. She also made the bridesmaids’ wrist corsages. I got a 1950’s cha-cha pearl bracelet from Saltaire Vintage Wedding Fair, to which my dad attached a little vintage silver charm in the shape of a pair of skis. Lovely friends also bought me a lovely pair of aqua blue crystal drop earrings as a birthday present to wear on the day. I also had a very cute pair of teal and navy Kurt Geiger ballet flats for the evening I never got round to putting on, and a Henry Holland jumper with skiing penguins on it for the chilly North York Moors night air, but all the dancing kept me warm! 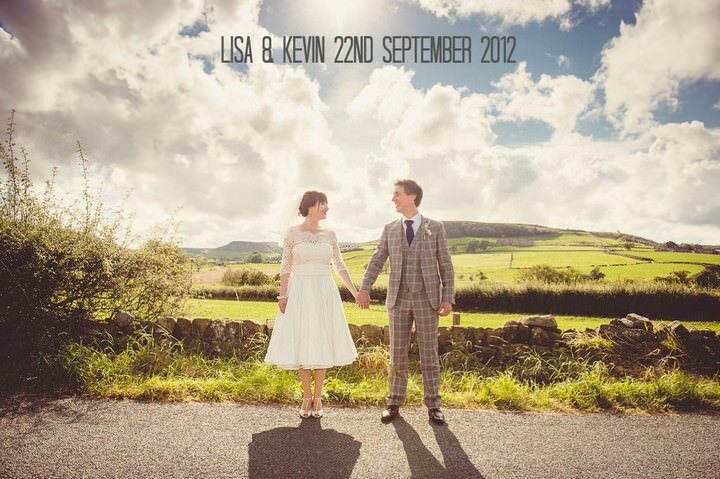 Kev’s suit was a Gibson of London number – very apt! He didn’t want a traditional morning suit and wears a smart suit for work every day, so something a bit different was the way forward. The suit came from Atom Retro, an online company specialising in mod, retro and indie clothing, owned by one of Kev’s friends. 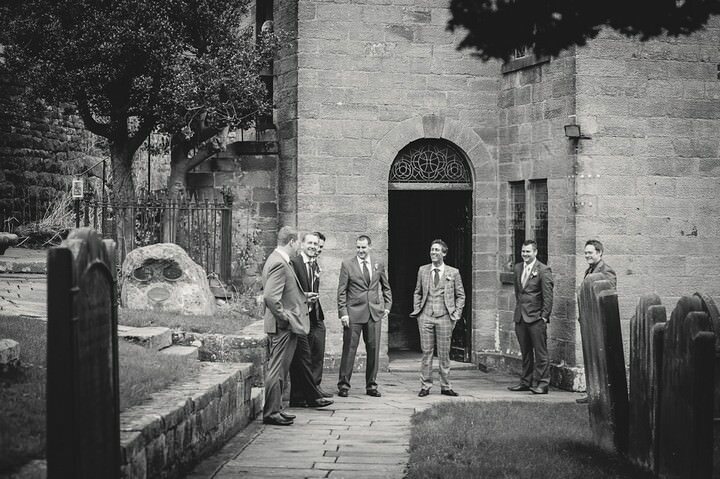 The ushers and dads wore their own grey suits and Kev and his entourage all wore navy ties with turquoise polka dots. 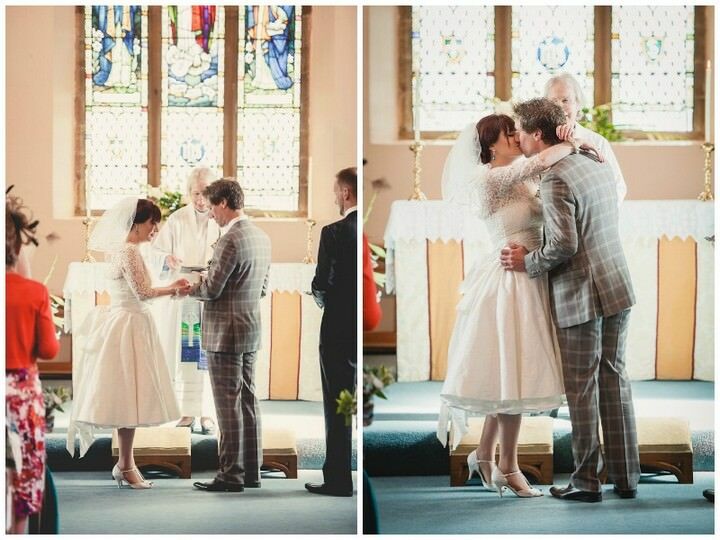 Kev also had a pair of wedding appropriate socks – teal and navy stripes. 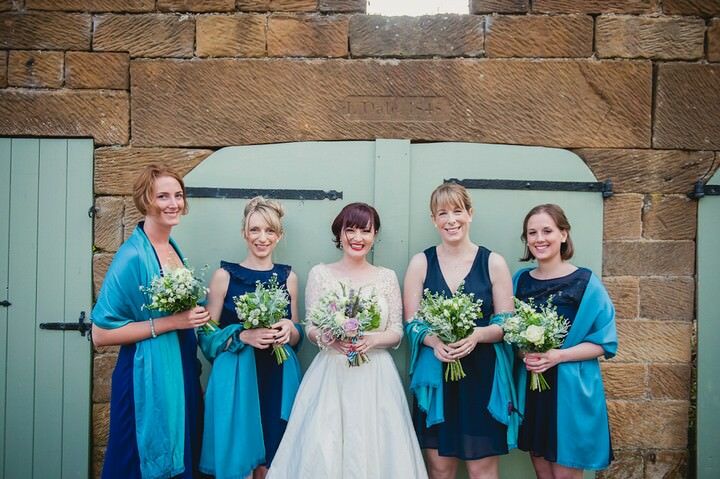 Equally typically, there were many and varied ideas surrounding bridesmaids eventually settled on a brief for the girls to choose their own dresses in navy chiffon. This worked really well to suit different colouring, height and body shapes and they all looked gorgeous. We tied the look together with teal and turquoise wraps and wrist corsages. 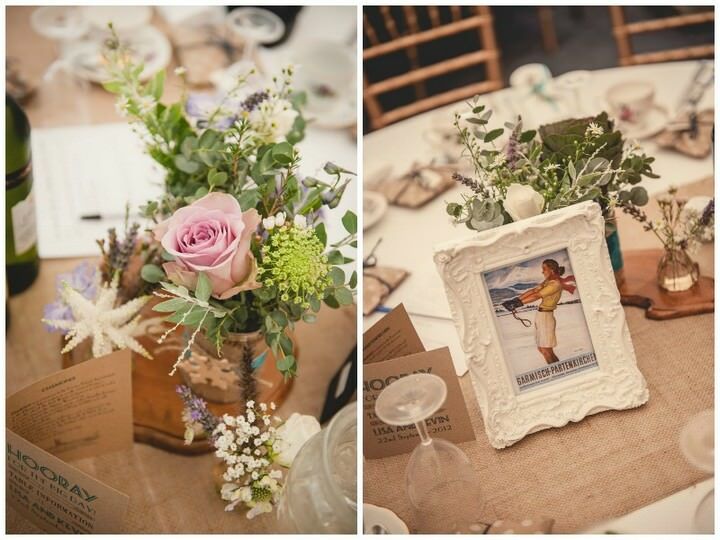 The theme was rustic vintage ski. Skiing because it is something we are both passionate about, vintage because I was creative director and thus could indulge my love of all things old and rustic to go with Danby Castle. 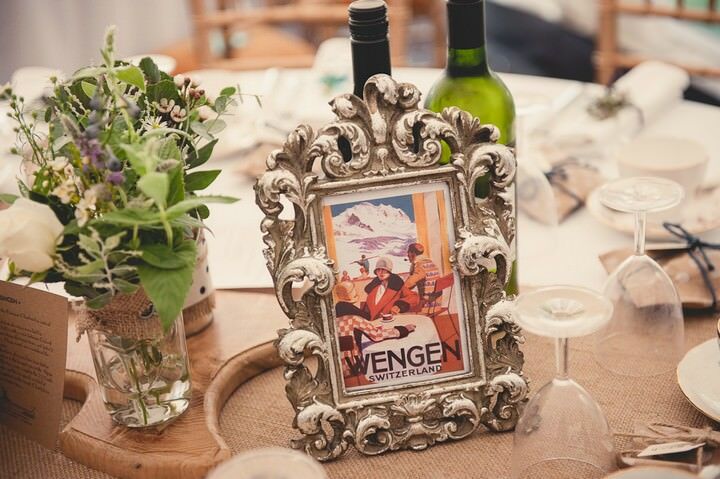 We did this through use of recurring vintage motifs (skis, stag’s head, snowflakes), naming tables after ski resorts which are part of the Alpine World Cup Circuit and using old travel postcards on the tables along with fun facts about the resort on the back of the menu. We also had a pair of giant antique cross country skis as a prop and an old sledge as our card box. More modern ski wear went in the photo booth dressing up box. 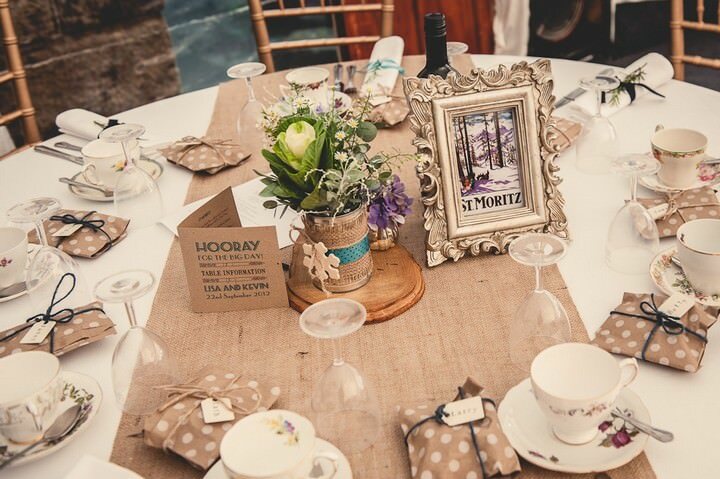 We used rustic materials such as hessian, brown ribbed kraft card and jute twine for all the stationery and tin can centre pieces. Oh, and my mum sourced a load of vintage doilies for the cake competition table. We used a lot of teal, navy and turquoise. We knew right from the start we didn’t want anything too formal or fancy, so opted for canapés instead of a starter then a good old Yorkshire pie and mash feast. The pies were amazing, I think pie tasting was Kev’s favourite part of the wedding planning process! 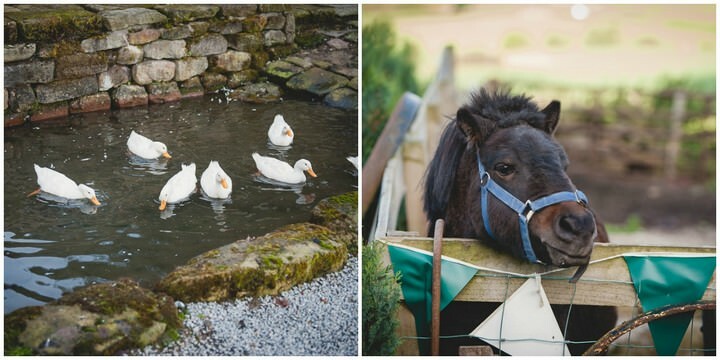 Our guests had a choice of Cow Pie, Welsh Hen or Dragon Pie with mash then garden peas and mushy peas . We then had a trio of dainty desserts – lemon pie, vanilla cheesecake and an incredible chocolate and cardamom tart. In the evening we had our cheese tower wedding cake, biscuits and Mallinson’s marvellous matrimonial chutney (made by my mum and dad); all the cakes from the cake competition and a chip van. 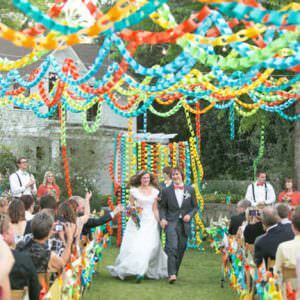 We had an iPod playlist of jazz and swing with a twist for reception drinks and another iPod playlist of 90’s tunes and indie for the meal. We booked a band from called The Fallen; they were totally awesome. We were worried people wouldn’t dance but by the end of the night the dance floor was packed out! A particular highlight was the boys v girls sing-off to the “I’ve got soul, but I’m not a solider” bit of All These Things I’ve Done. 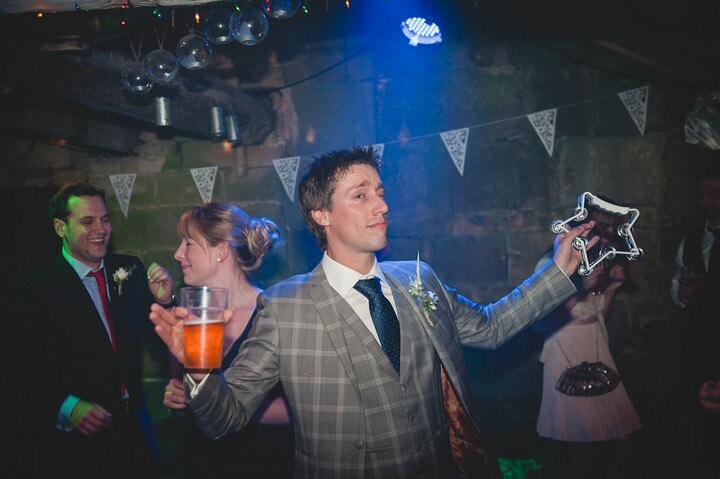 Danby Castle provided a DJ for the bits in between the band. 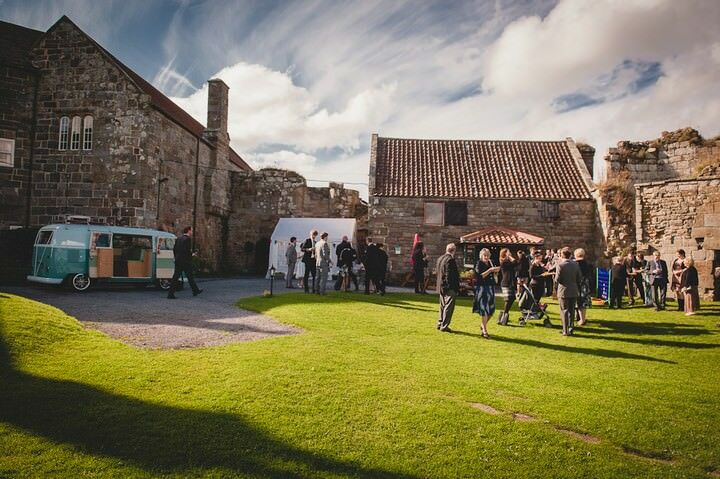 Danby Castle provided giant outdoor games, a photo booth and dressing up box which resulted in some very funny photos. 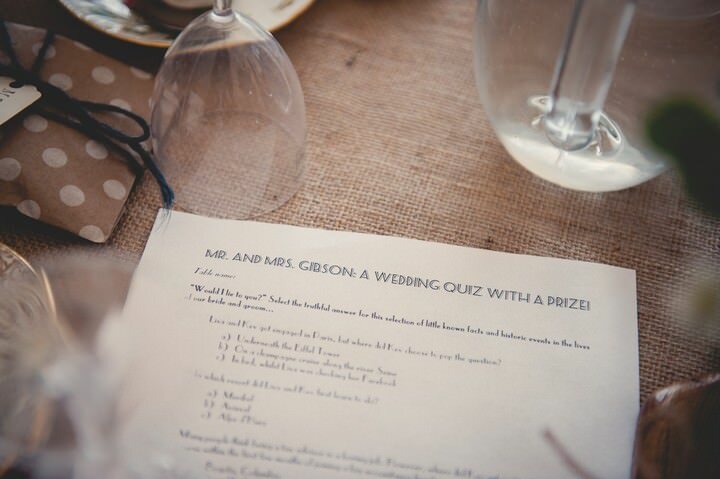 We also did an I Spy photo hunt for the children and a Lisa and Kev quiz for people to do over the meal, which was won by the guests at the table we were sat on… not a fix, honest! Finally, we had a cake competition that provided a lot of entertainment and was an awesome talking point from the moment the invitations went out! 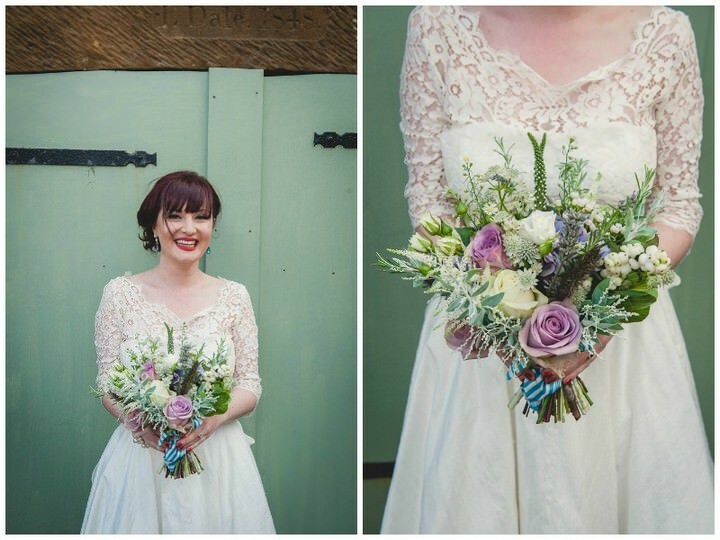 My bouquet was made up of muted purples and pinks and the girls had lots of greenery and ivory flowers. The bouquets were hand tied, mine finished with my granny’s scarf and the girls’ with hessian and teal ribbon. 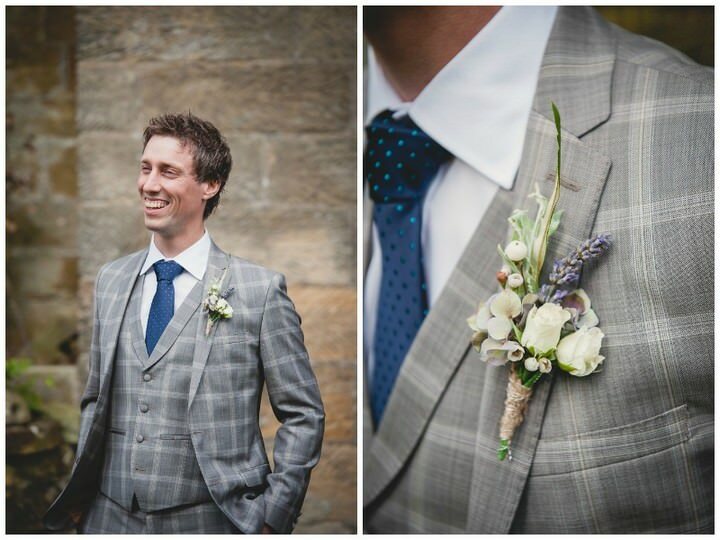 Button holes echoed the flowers in the bouquet. 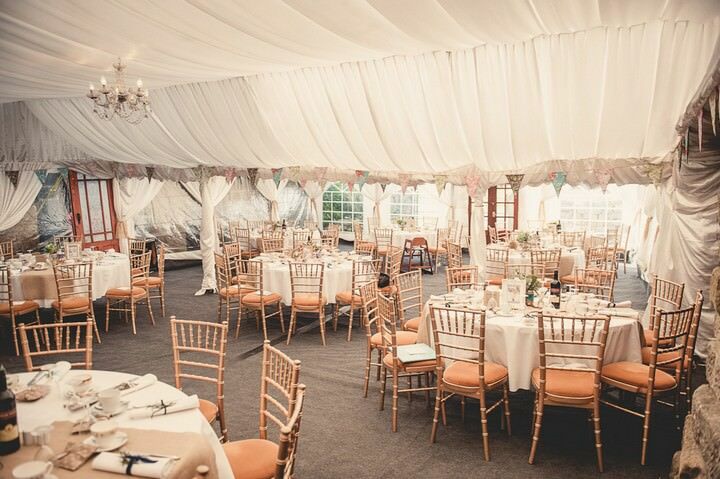 We were lucky in that Danby is a stunning venue both indoors and out, plus lot of lovely things are part of the décor already (e.g. 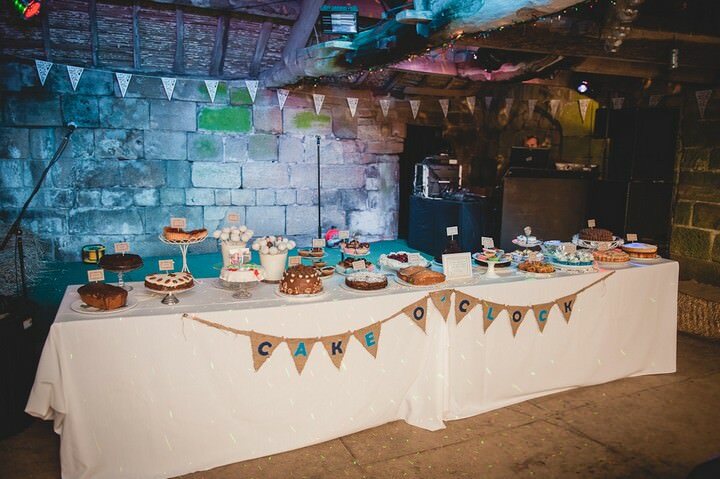 colourful bunting, bird cages, vintage china, little vases of flowers in the bar) so we didn’t need to do too much. 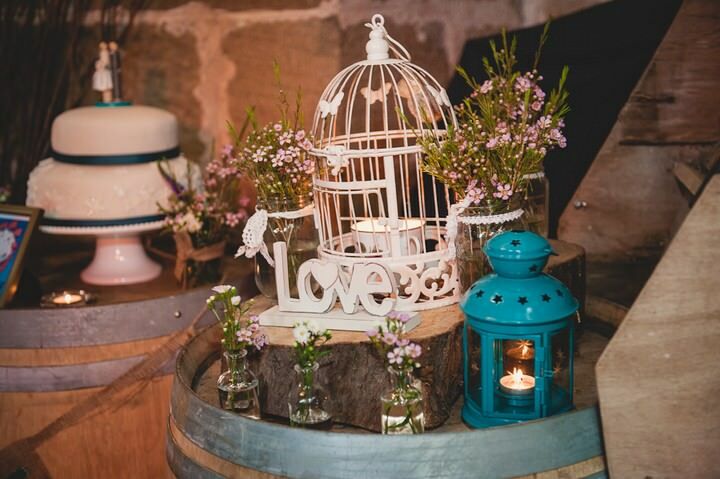 We brought along a few bits from home to go with our theme and to provide a pop of teal and turquoise colour and a favourite letterpress print of the lyrics “love is all you need”. 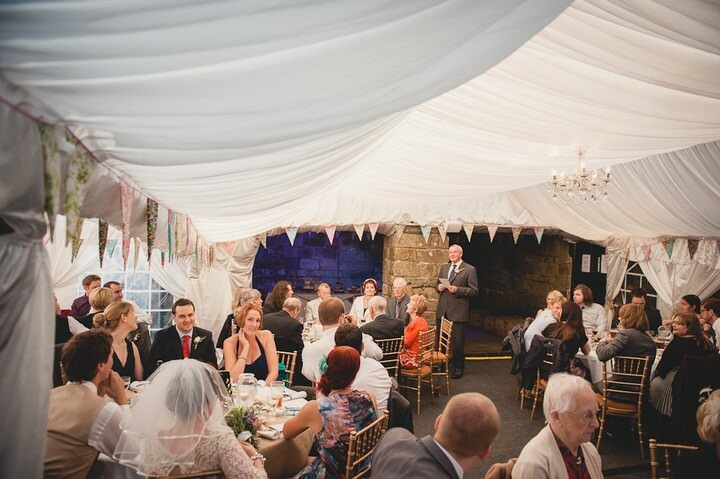 • Hessian and felt appliqué bunting for the après-ski cake table (“Cake O’Clock”), Danby Castle entrance (Mr & Mrs) and “bride and groom” for our chairs. • Confetti cones made from old ski maps and filled with dried lavender – smelt divine, turns out it is pretty hard to pick out of your hair. 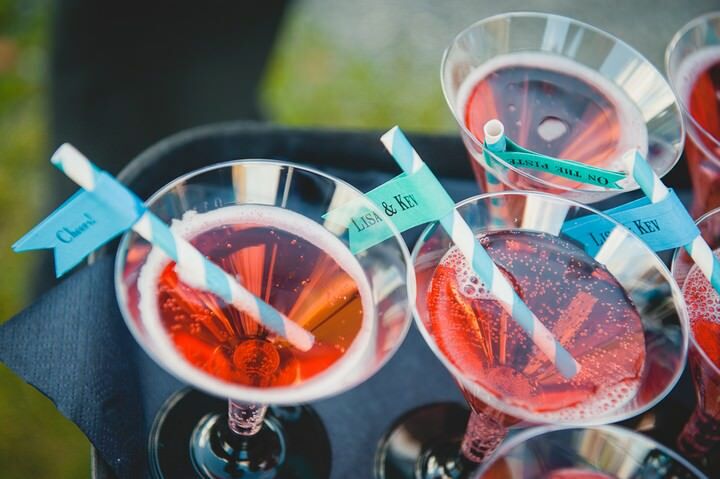 • Favours were a spin on our favourite drink of amaretto and cokes and doubled as place names. 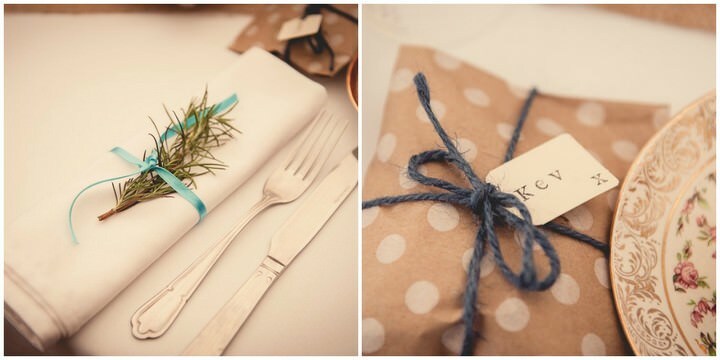 Our bridesmaid Lizzie made delicious amaretti biscuits, we added in a packet of mini colour bottles, wrapped them in polka dot kraft bags and tied gift tags to them that our friend Jane had painstakingly stamped with everyone’s names. All 90 of them! There was a production line of ushers the day before the wedding to get all the favour bags finished off. 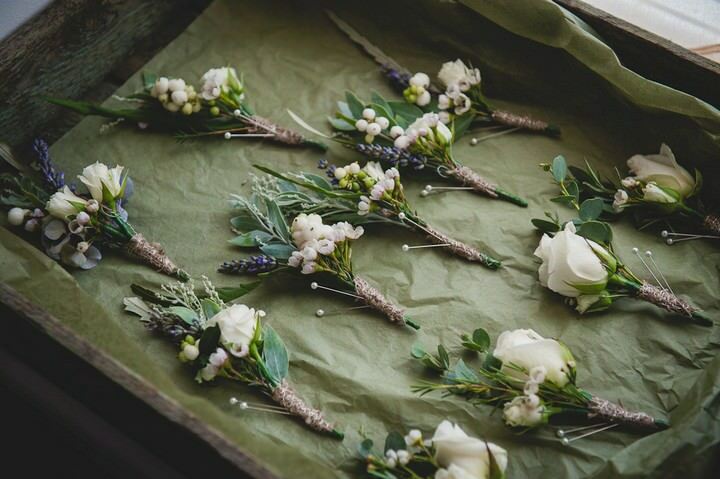 • Sprigs of rosemary from our garden were tied to the napkins with random bits of ribbon in wedding appropriate colours. • My mum and dad made loads of chutney and our friend Dan made amazing oatcakes for the evening cheese fest. 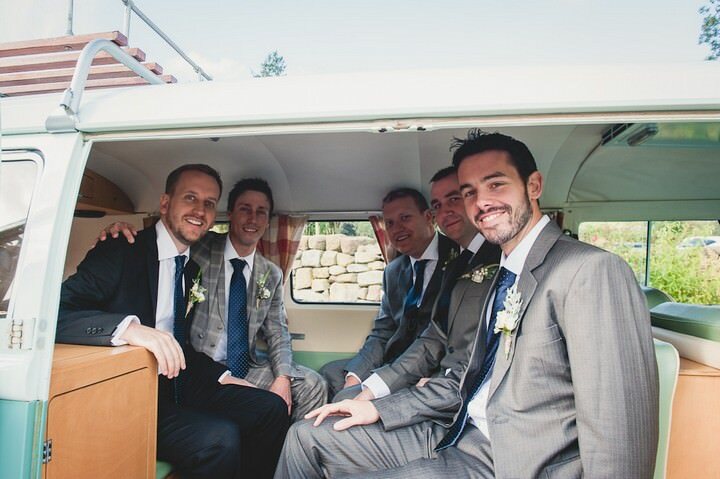 • Our best man has known us since before we got together, and rather than the usual ribbing of the groom in his speech he talked through the story of Kev and I getting together and how our relationship played out. Hilarious and touching in equal measure. • Our fabulous guests made a whole lot of cake for the après-ski cake competition. • We used the iconic Chamonix ski jumpers image as a signing canvas and more vintage ski travel postcards on a wishing tree. • We printed off photos of ourselves as children and of nights out and ski holidays with friend and hung these from ‘washing lines’ around the bar with mini pegs. 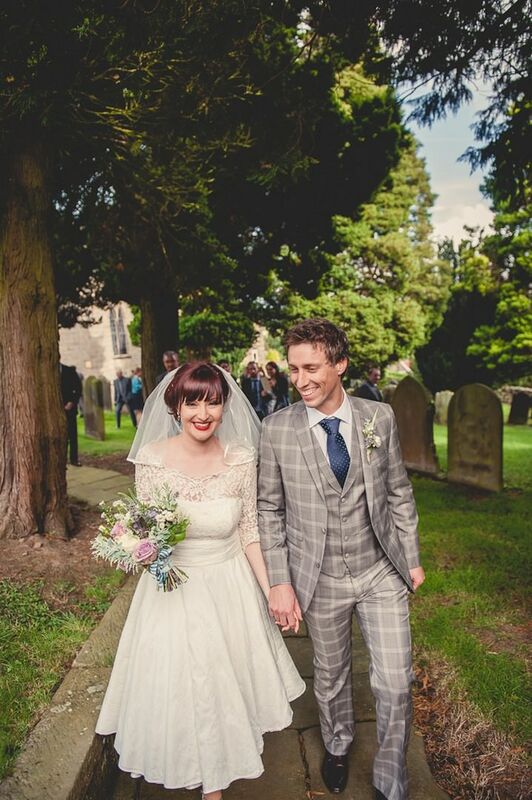 The whole day was just amazing from start to finish – we loved it all. 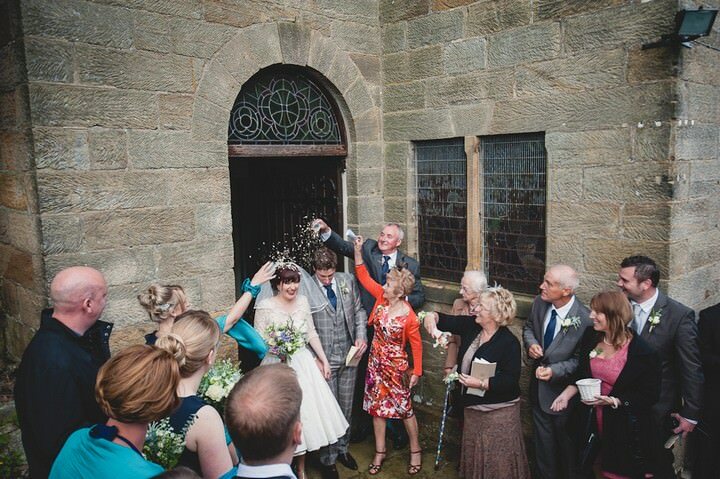 Walking into the church, seeing everyone there then getting a big kiss off Kev when I met him at the altar was amazing. 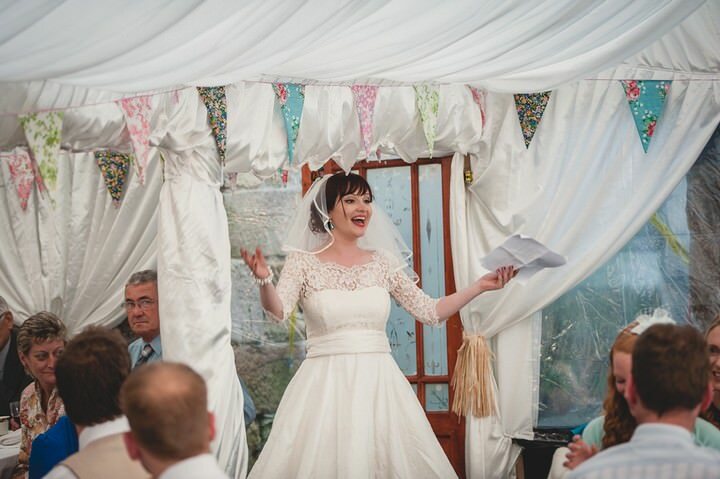 Also the speeches – one of my favourite parts of any wedding. 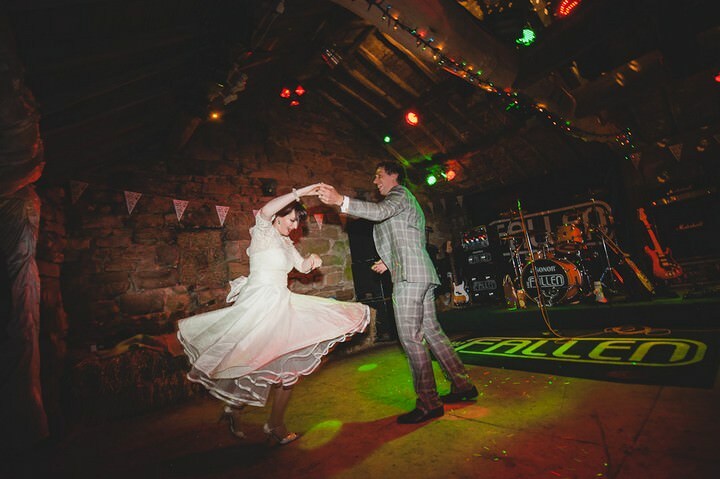 Finally – seeing everyone thoroughly enjoying themselves on the dance floor! 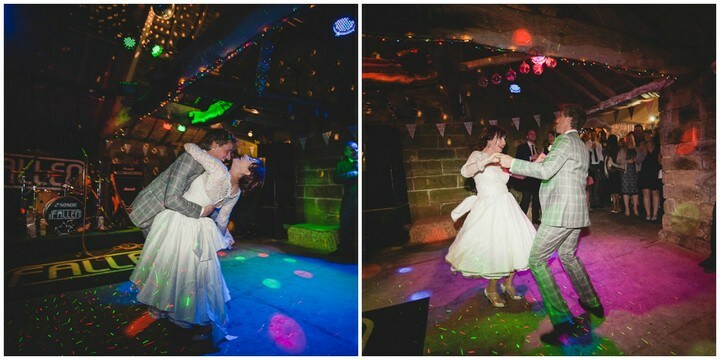 The never-ending first dance!! 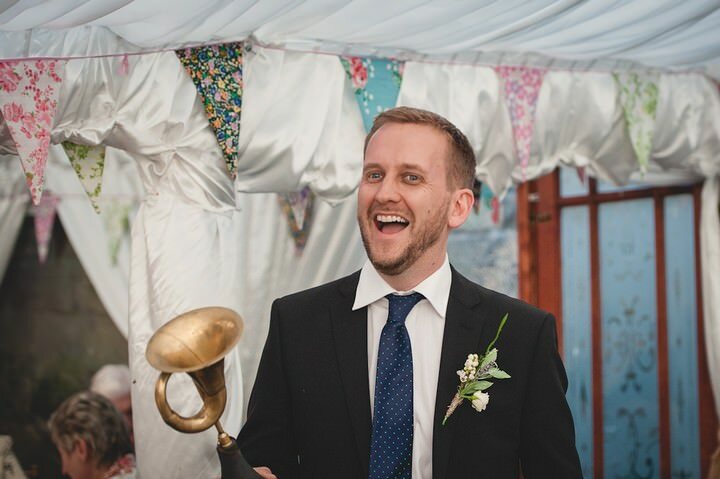 We’d chosen our song (Signed, Sealed, Delivered) as it was upbeat, fun, and – most importantly – short… but the venue played an extended version featuring a whole lot of jazz piano! • Start early, especially if you are doing a lot yourselves and don’t underestimate how long it will take you to do all your DIY projects. I ended up in mad scramble of crafting in the last few weeks and there were ideas I didn’t manage to finish. 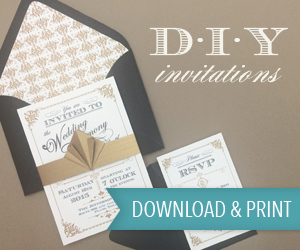 On the other hand, don’t beat yourself up about this – your guests will have no idea about the little details you didn’t quite get round to completing and your wedding is going to be amazing regardless! • Take the week off work beforehand, if at all possible. This a) helped us get all our last minute bits and bobs done and b) got us into holiday / celebration mode well before the big day itself. • Don’t be afraid to make what could be perceived as unpopular or unusual decisions – it’s your day, your way. • We delayed our official honeymoon so a) we had something to look forward to after the wedding and b) it was one less thing to worry about before the wedding! 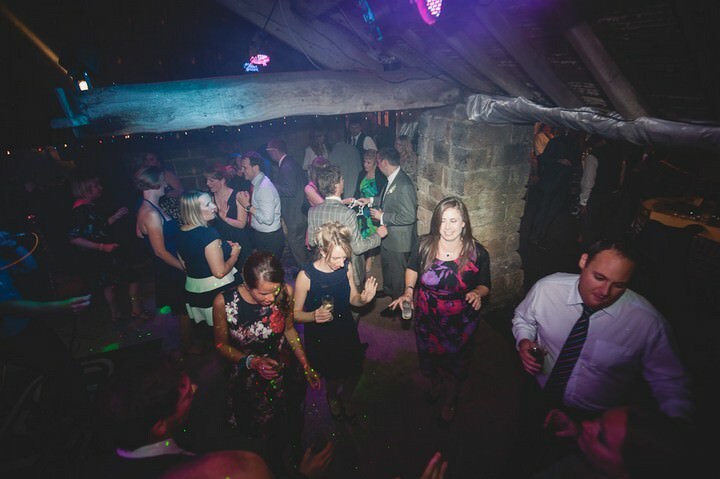 • If the bride and groom are up and boogieing and generally having a ball, people will follow you. • Accept that you won’t get chance to talk to many people in-depth but it is a brilliant feeling having everyone there. 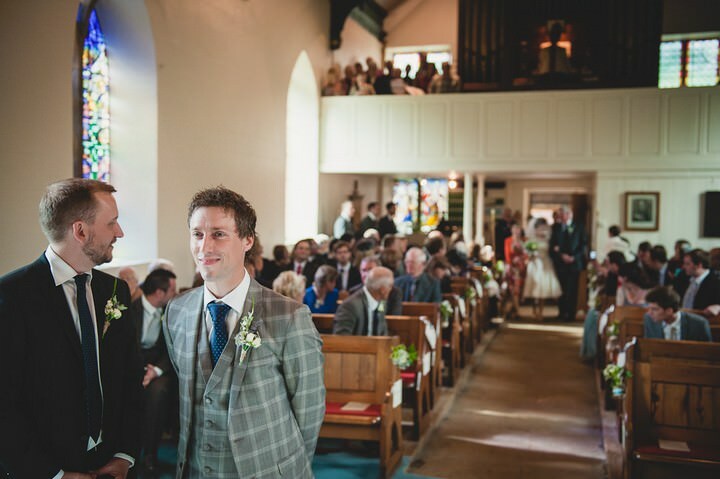 We didn’t want a formal receiving line; instead, we managed to say hello to everyone and they got to congratulate us as they filed out of church which was a lovely start to married life. 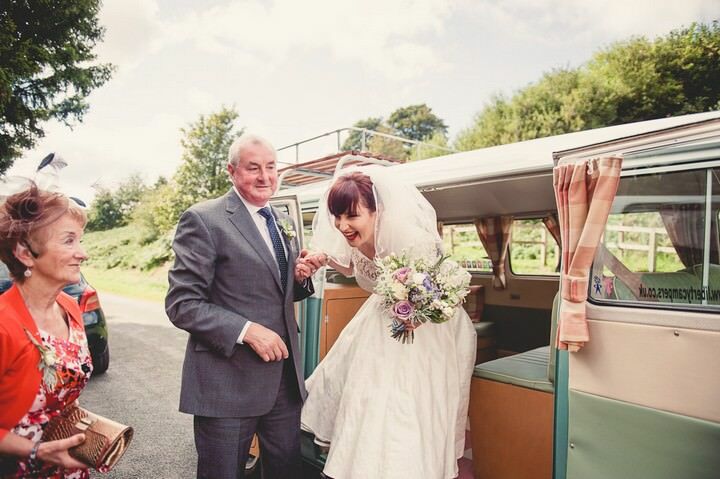 • Kev and I sent each other wedding cards on the morning of the wedding – my wonderful husband gave a great piece of advice to his rather control-freaky bride-to-be: “enjoy every minute, what will happen, happens and if anything does go wrong remember that’s what bridesmaids are for”. 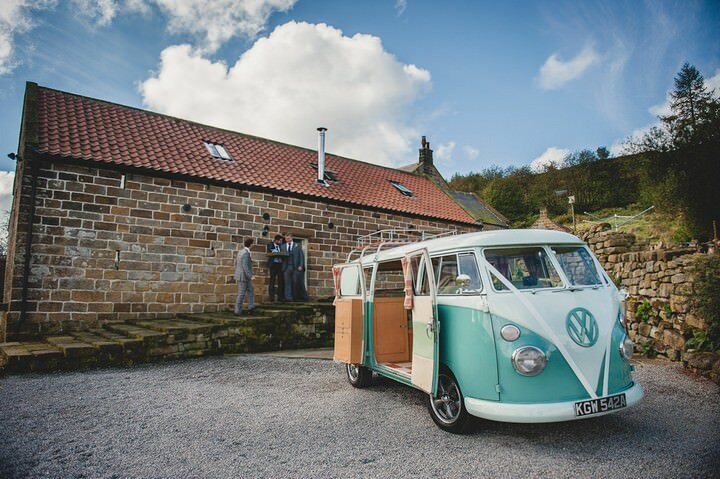 Hair – www.grahampaulhair.co.uk a mobile hairdresser from Pickering found by more luck than design, and he was brilliant! I am sad we live that bit too far away for him to come and do my hair all the time. 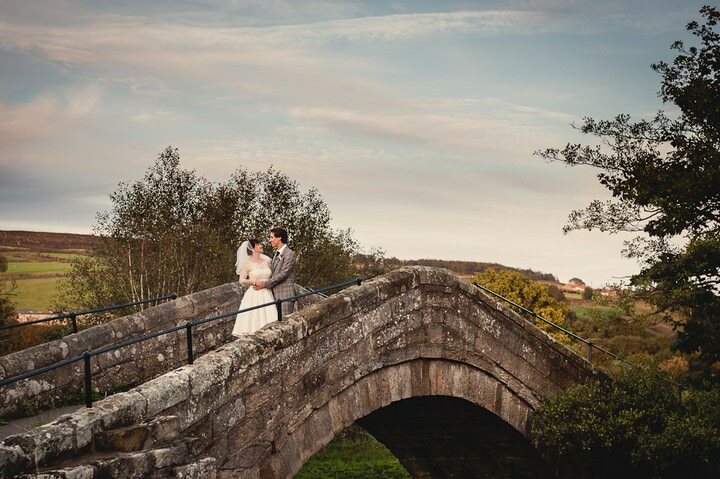 I’m a York based wedding photographer, covering Yorkshire and the north of England. I specialise in relaxed documentary photography, capturing all the candid moments of the day from start to finish. Isn’t the suit amazing! 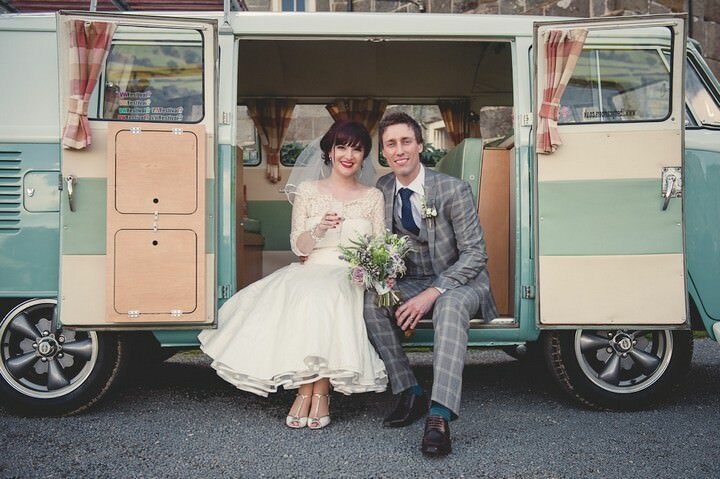 so good to see a groom in something a bit different! 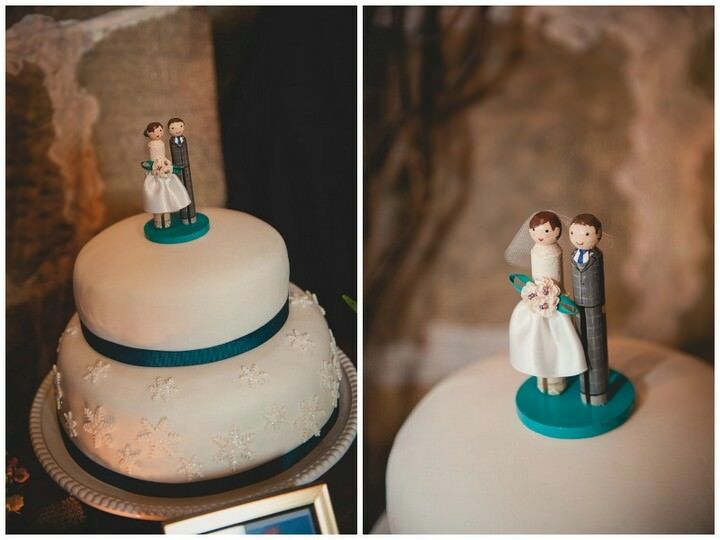 Thank you, Kelly, for featuring our wedding! And to everyone for the lovely comments. I think the biggest thank you though needs to go to Chris for taking such an amazing set of pictures – cannot recommend him highly enough. 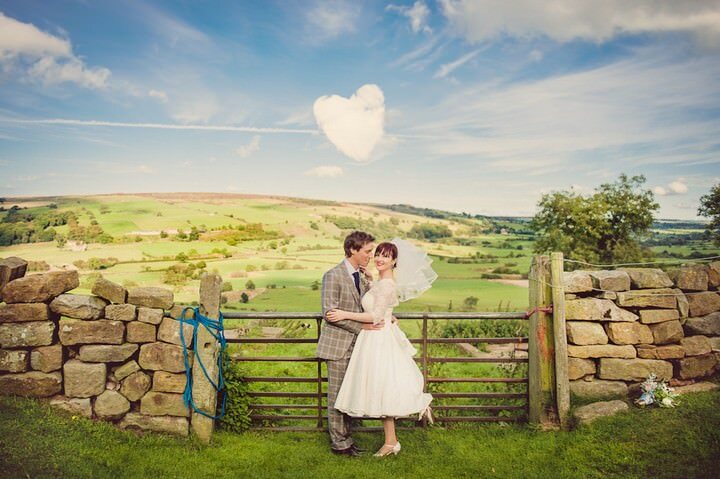 Beautiful photographs of what looks like an AMAZING wedding, love the portrait with the heart cloud, great touch! 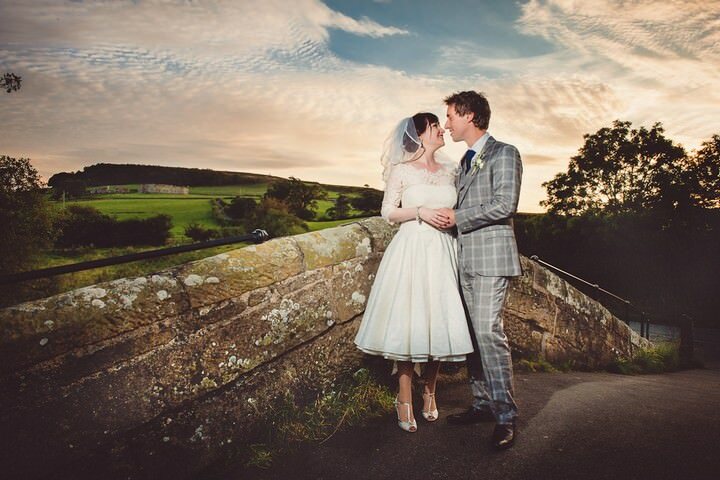 brilliant countryside setting, the suit pattern is truly brilliant! 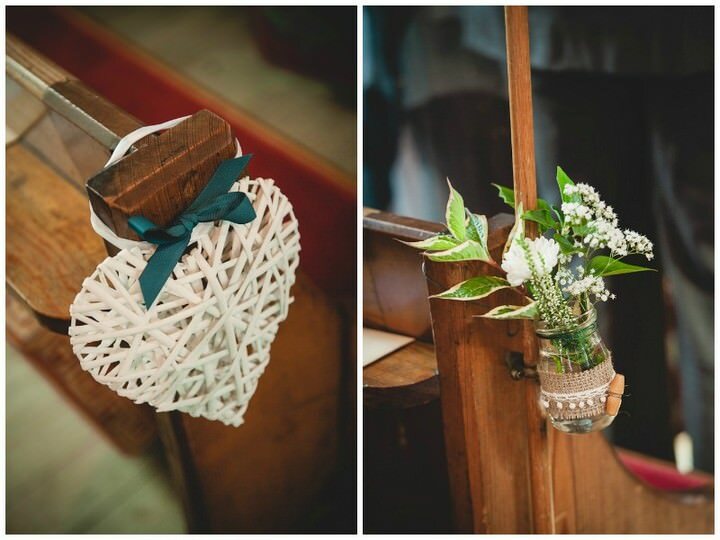 I love the hearts you have hanging from the pews in the church! Where did you get them or if you made them can you share how you did them?? 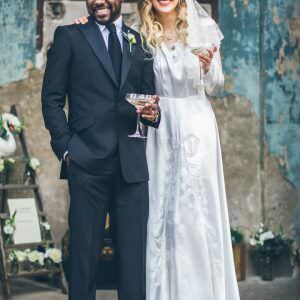 I’ve seen these before but can’t find where to buy them for my daughter’s wedding. 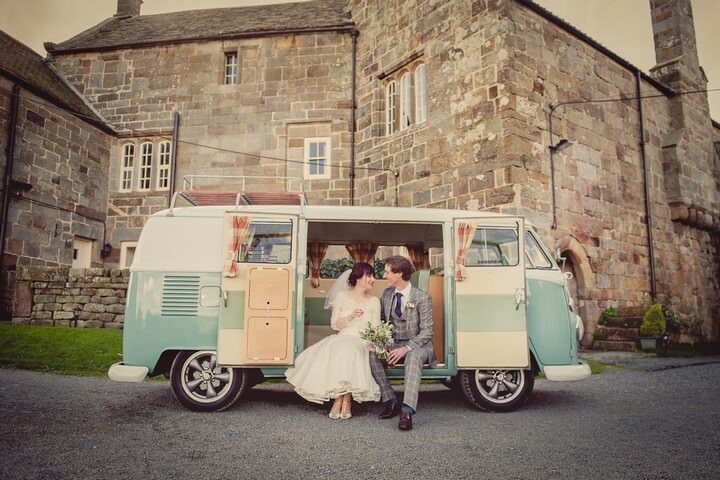 What a quirky & awesome wedding!!! 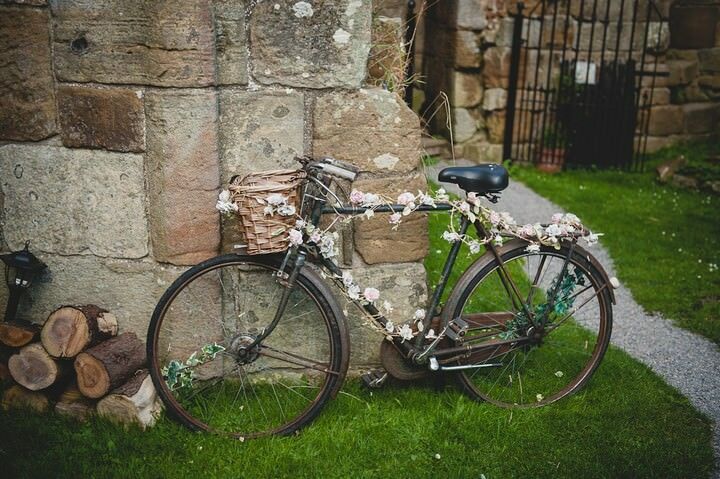 Hi Sue, sorry if this reaches you too late – the hearts were from dunelm mill! I tied the teal ribbon on myself. Also can pick them up on ebay. Hope that helps and your daughter has/had a great day.